This original painting is available for purchase. Gallery wrapped giclée prints are also available in sizes ranging from 8x10 to 30x40 inches, which are perfect for the home or corporate office. Terra Mater, or “mother earth”, was the goddess of fertility and growth in Roman mythology. This is an original contemporary still life oil painting, which includes a Mars Reese's Peanut Butter, Hershey's Chocolate Kisses, Skittles, gumballs and a chocolate rabbit. Gallery wrapped giclée prints are also available in sizes ranging from 8x10 to 30x40 inches, which are perfect for the home or corporate office. This original oil on canvas painting is an awesome scene of the morning surf of Kennebunkport, Maine. Original Acrylic on canvas painting, 39x78 inches by Hall Groat Sr. This original painting is available for purchase. Gallery wrapped giclée prints are also available in sizes ranging from 8x10 to 30x40 inches, which are perfect for the home or corporate office. This stunning gallery wrapped giclée print by Hall Groat II is of a classic baseball and glove, and was inspired by Babe Ruth and the American Dream ideal. It's painted in a classical style in umber, gold, yellow, red, gray, green and blue tones.Gallery wrapped giclée prints available in standard and custom sizes. Perfect for home, office, or interior design project. This gallery wrapped giclee is of a vintage baseball and bat, and was inspired by Mickey Mantle of the New York Yankees . This original painting is available for purchase. Gallery wrapped giclée prints are available in sizes ranging from 8x10 to 30x40 inches, which are perfect for the home or corporate office. In this DVD, Hall teaches how to paint the Adirondacks landscape. He introduces various landscape painting concepts and techniques that are essential to painting a classic scene with water, rocks and trees. In this DVD, entitled Tomatoes, Peaches and Pepper, Hall introduces the eleven important foundation painting phases, such as "form light and shadow" that are the foundation of classical observational painting. In this DVD Hall teaches us how to paint scrumptious desserts, and introduces several techniques for painting a variety of delicious baked foods. In this DVD Hall introduces various classical techniques for suggesting the illusions of transparent and reflective glass, and paints a shimmering martini glass, an elegant ivory ashtray from Maxime's Restaurant in Paris, and a lovely Waterford crystal glass filled with water. Original Watercolor, Boat Works, 22x30 inches by Xavier Gonzalez, Spanish Artist This masterful watercolor is being sold in its original ornate, wooden frame. Original Watercolor, Roses, 30x24 inches by Xavier Gonzalez, Spanish Artist. This masterful watercolor is being sold in its original ornate, wooden frame. Dalí, Salvador (1904-89): Spanish painter, sculptor, graphic artist, and designer. Rembrandt's Grandmother is a very sensitive depiction of the women who he greatly admired and loved. The impeccable attention to detail is evident in the subtle layering of line, value and texture. New York City Street Food Vendor Painting 18×24 in. 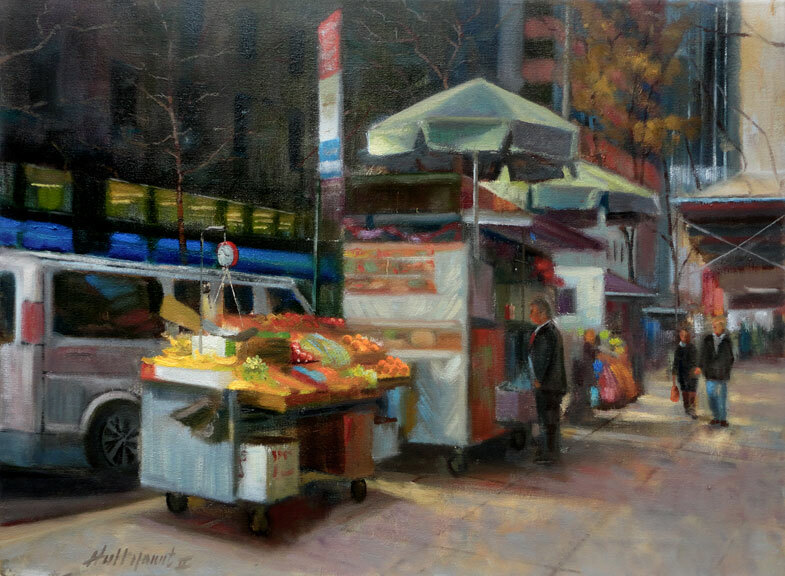 This original oil on canvas painting is of a New York City street food vendor that I discovered on a crowded street corner around mid-town Manhattan. What first caught my attention was the presentation of the fresh fruit. I thought to myself “This is like bringing the grocery store right out onto the street.” The vibrant colors of the produce set against the dark buildings in the background really pulled me in. The perspective of the sidewalk and figures interacting with the surroundings was pretty cool. In New York City it’s interesting how most street corners have some type of street vendor. In front of the Metropolitan Museum there are about a dozen vendors lining the front sidewalk seven days a week. There are the vendors that sell just the hot dogs and soda, and then the ones that peddle those over-sized, salty pretzels. It has always amazed me how much these empty calorie snacks cost, and how much tourists are willing to pay. Then there are the odd-ball characters who manage these street vending food operations. I’m amazed to discover that Zagat is now endorsing New York City Street food vendors. Receive newsletters from Hall Groat II.